This Showerforce pump has been discontinued. Please see the Turboboost + 2 bar Pump as a suggested alternative. *Note The SF 2 Bar pump is unavailable the below button will take you to our recommended replacement product. 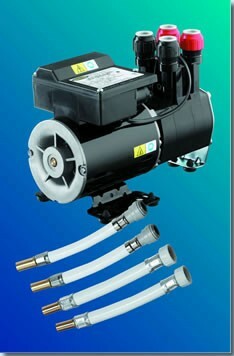 The SF 2 Bar shower pump provides exceptional power and will run two showers or drive multi-outlet installations. Suitable for use with Showerforce shower valves or any other top quality valve. Direct connection to the hot water supply, giving access to an additional 20 - 30 litres of hot water for prolonged showering. Pack includes four flexible hoses for simple, quick connection to reduce installation time. Built-in anti-vibration pads to reduce noise.